Illustrator, poster designer, sculptor, writer and painter. He was admired by many designers including Franquin, Rene Wisp, Cabu, Shepherd. 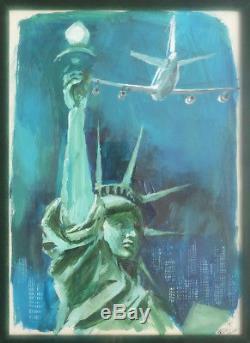 The drawing: Boeing 747 and the Statue of Liberty in New York. 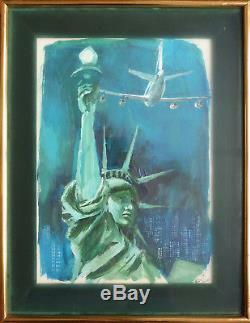 Inscription on the back of the frame: new-york 1973-83 boeing 747 g. Format "at sight": 29 x 20 cm. The drawing is framed under glass. Frame size: 37 x 28.3 cm. Hand delivery possible paris 9th. The item "original drawing gouache george beuville statue of liberty new-york" is on sale since Monday, July 23, 2018. It is in the category "art, antiquities \ art of the twentieth, contemporary \ drawings, wash". 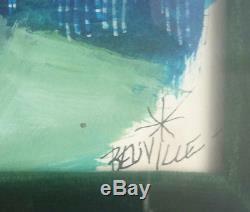 The seller is "dessinoriginal" and is located in / in paris. This item can be delivered anywhere in the world.